• (see above) string sequins, pallettes and beads onto thread in a random fashion and (see below) wrap around the wire on lights. we did ours in 4ft lengths at a time to keep everything from getting all tangled up. 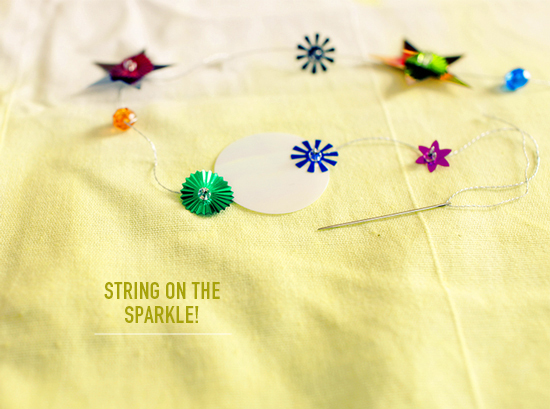 • wrap the silver sequin trim around the cord for extra glitter and sparkle and to cover the thread a bit. 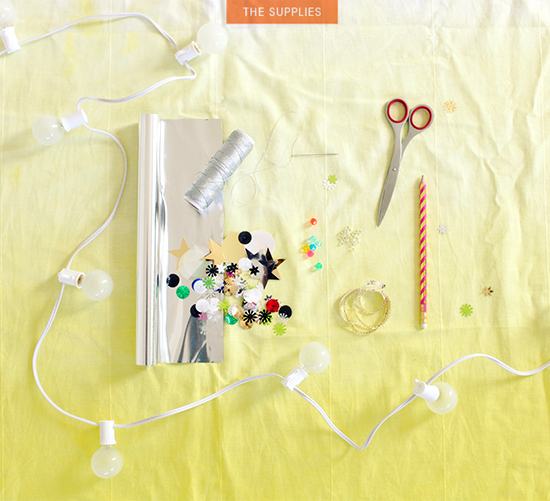 this will also help keep your sequins and beads in place. • (below) to make reflectors, create a 4.5 circular pattern out of cover weight paper. fold in half and then fold in half again. snip about 3/8 of an inch from the point in a straight line so that when you open it back up you’ve created a hexagon. • mark the fold lines with a pencil. • trace your pattern onto the aluminum using a pencil with a slightly dull point. this will create more of an indent than a drawn line. take care to mark the edges of the fold line to help guide you when you cut the circles out. • cut circles out. now cut where the folded lines are, stopping 1/2 inch short of the center. next cut a line in between each of the lines you’ve already cut. • snip the interior in the same fashion along your folded mark, again taking care to stop short of the center so that your piece stays intact. you can poke a hole in the center with a needle to help you get scissors through the aluminum for the initial cut. • bend back the aluminum on the inside and slightly curl the ends for added sparkle. • unscrew bulb and feed through the center and re insert into socket, taking care to be sure the reflector is resting on the bulb and not touching the metal end of the bulb. this will be easy to tell as the bulb should easily screw back into socket without any interference from the aluminum. 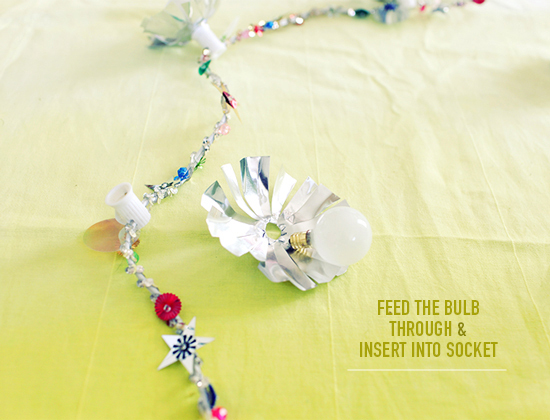 *** to store hanging lights, bend the reflectors around the light bulb carefully and wrap with a little tissue paper. as with all string of lights with large bulbs store with care. The final result looks spectacular! Well done Natalie! What a happy idea! It looks so cute! I really want to give it a try, and If I dó, I’ll definitely show it. Have a great Day and weekend and thank for the inspiration! Cute and simple. 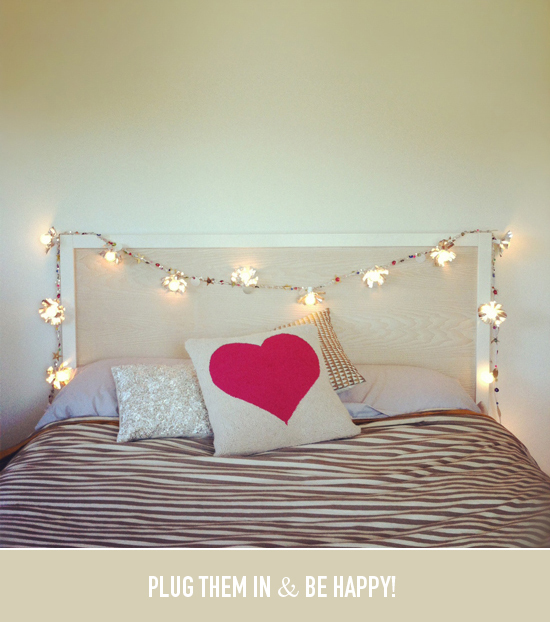 Adds a little fun to a plain headboard. I LOVE your pink heart pillow! Do you remember where you got it from? This is such a fun way to spice up any room. I love the vivid images and detailed tutorial! cute! would be a fun craft for kids too! What a FUN idea!! I LOVE it!! How could you NOT be happy if you have these lights in your house!! such a great idea! i will definitely be making this. I love those lights from Target– my back yard is full of the clear ones and I just snagged some frosted ones to use indoors. I will definitely be taking some inspiration from your DIY! Thanks! SHUT UP. So cute. Wow. 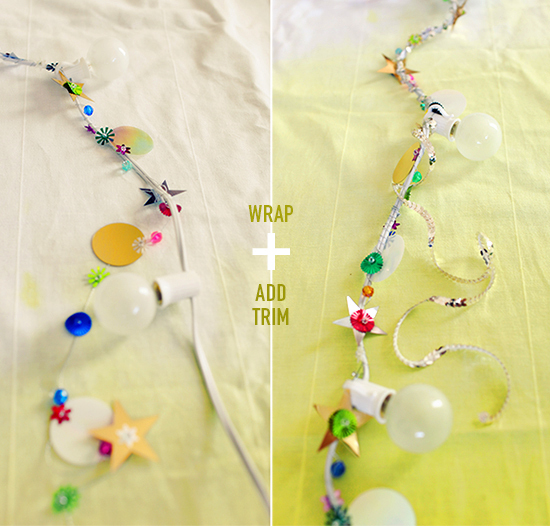 I never thought about wrapping sequins around the chord — what a great way to add some sparkle. I want to make one of these to hang up as-is all year round…but I might steal the concept for Xmas too. Pingback: Tuesday: Newsy Snacks For Busy People | justb.